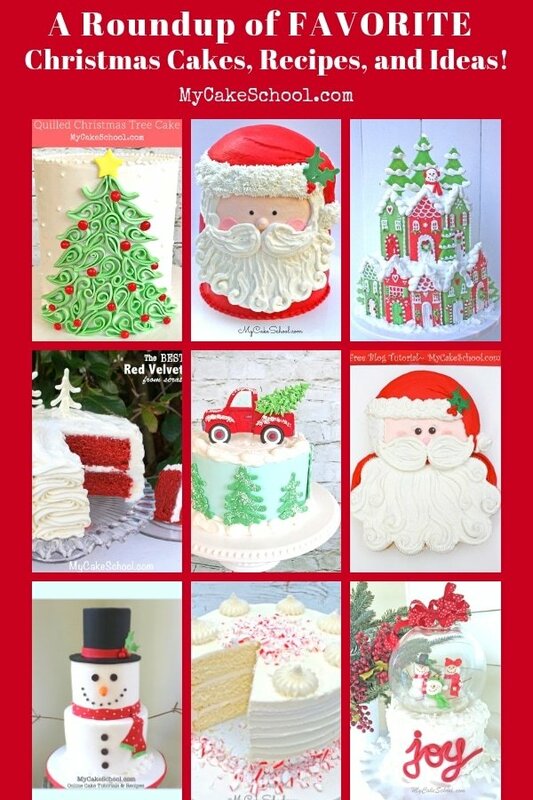 A Roundup of Our Christmas & Winter Cake Tutorials! 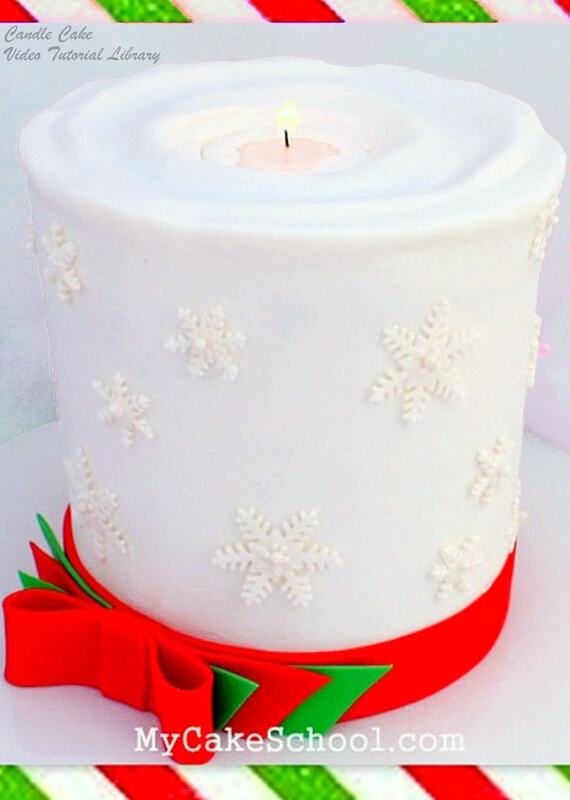 ‘Tis the season for Christmas and Winter cakes, tutorials, and ideas! Hooray! Today I’m going to share a roundup of our favorites from over the years. We will be constantly adding to this list throughout the season and from year to year. We hope that you enjoy these festive cake ideas as much as we have. It’s time to start planning for the holidays! 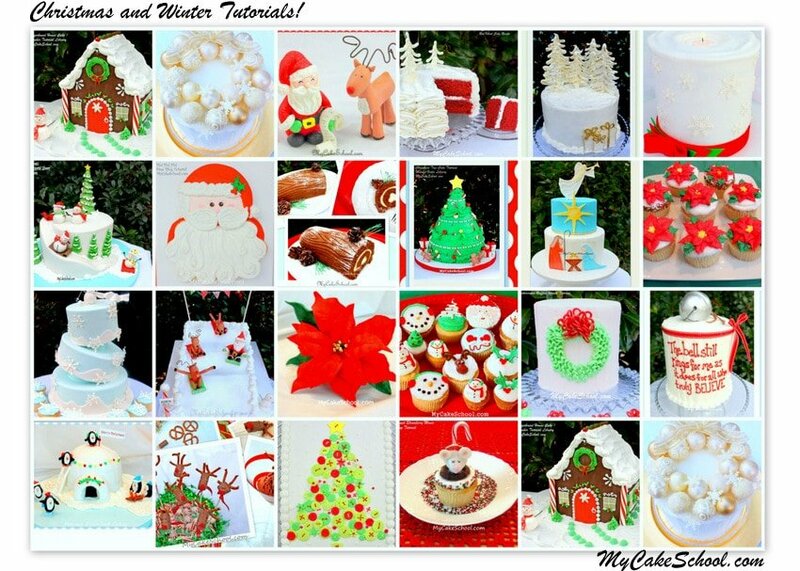 Over the years we have made so many Christmas and winter themed cakes! Some have been for our member section on MyCakeSchool.com, and others are featured in our Free Tutorials section. 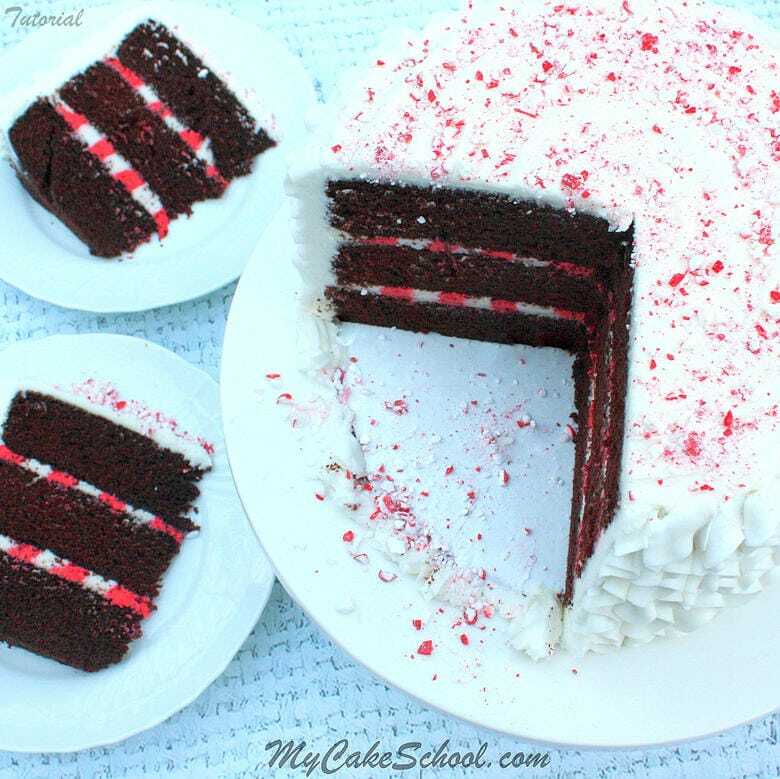 This candy cane cake would be perfect for Christmas parties! The striped filling is so unexpected and festive. Keep this fun & easy decorating technique in mind whenever you need a colorful striped filling! 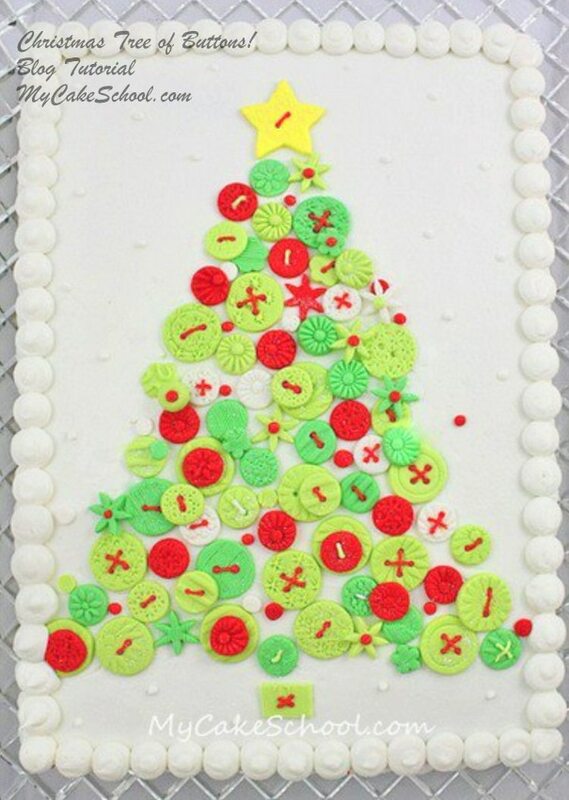 This Quilled Christmas Tree Cake Design is a new favorite of ours for Christmas! This is one of those designs that looks so much more difficult than it actually is! (I love it when that happens!) – This is a cake video from our member section, and in it we demonstrate how to easily create the different quilled shapes along with a simple template to follow. We’ve made a couple of other quilled cake designs (for different seasons) but this may be my favorite! 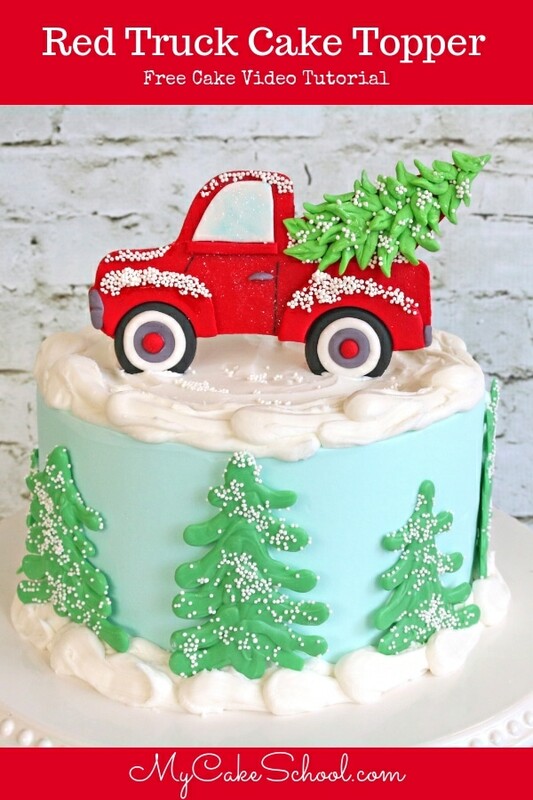 This sweet Red Pickup Truck Cake Topper is perfect for Christmas and winter cakes!! It’s amazing how a simple cake topper can take a cake to a whole new level of personality and in this case, cuteness! 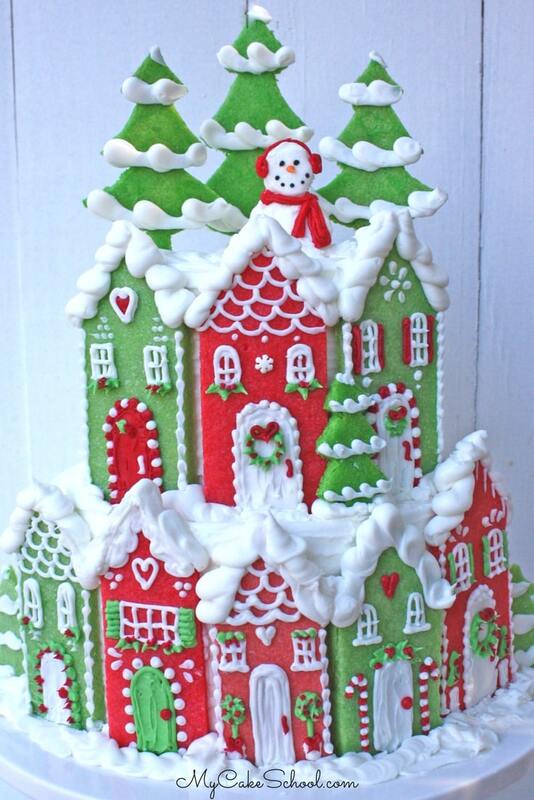 Here’s another favorite of ours from our Member Cake Video Section- an ADORABLE Christmas Village Cake with sugar cookie houses! We had so much fun making this cake video. The design options are endless when it comes to decorating the Christmas cookie houses, but we kept things very simple with just a bit of white piping on each house, as well as piped sprigs of buttercream greenery here and there! 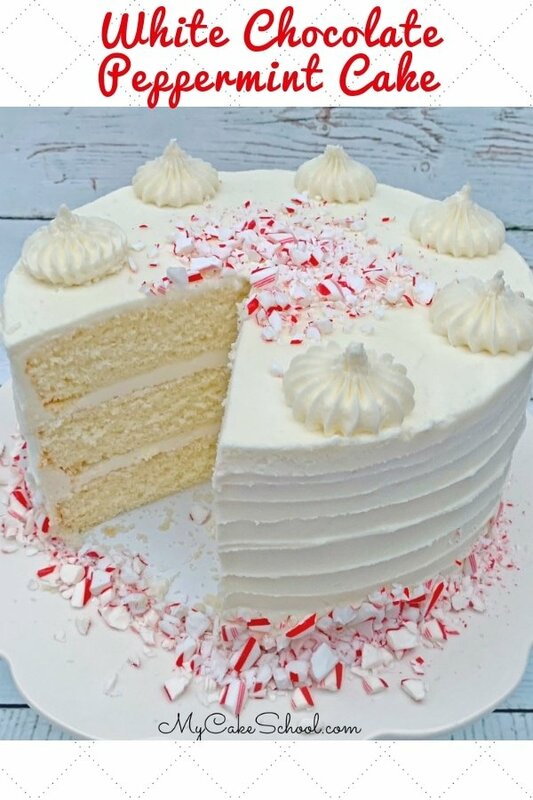 Oooooohhhhh this next cake is a new favorite of ours for Christmas and winter parties: White Chocolate Peppermint Cake! I just love chocolate and peppermint together, and in this case, white chocolate and peppermint! It is such an elegant dessert, and oh so delicious! 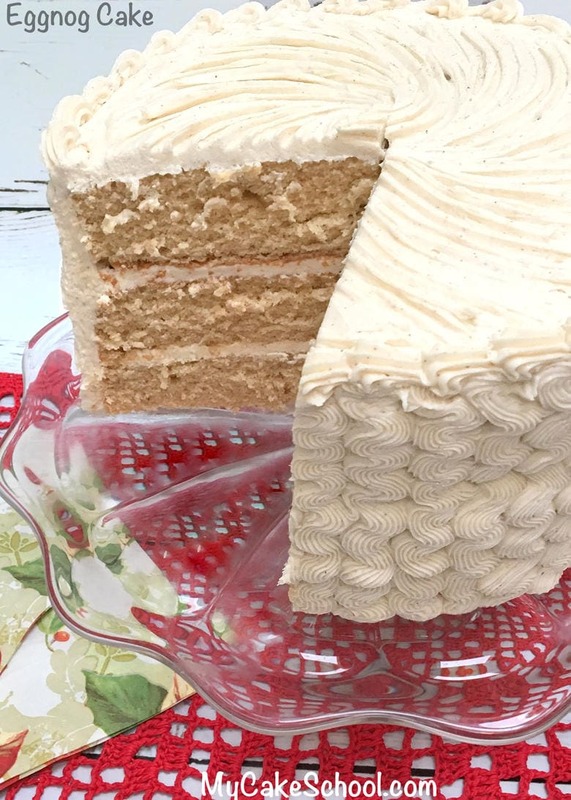 You’ll find the recipe for White Chocolate Peppermint Cake as well as White Chocolate Peppermint Buttercream! Don’t miss this amazing recipe! 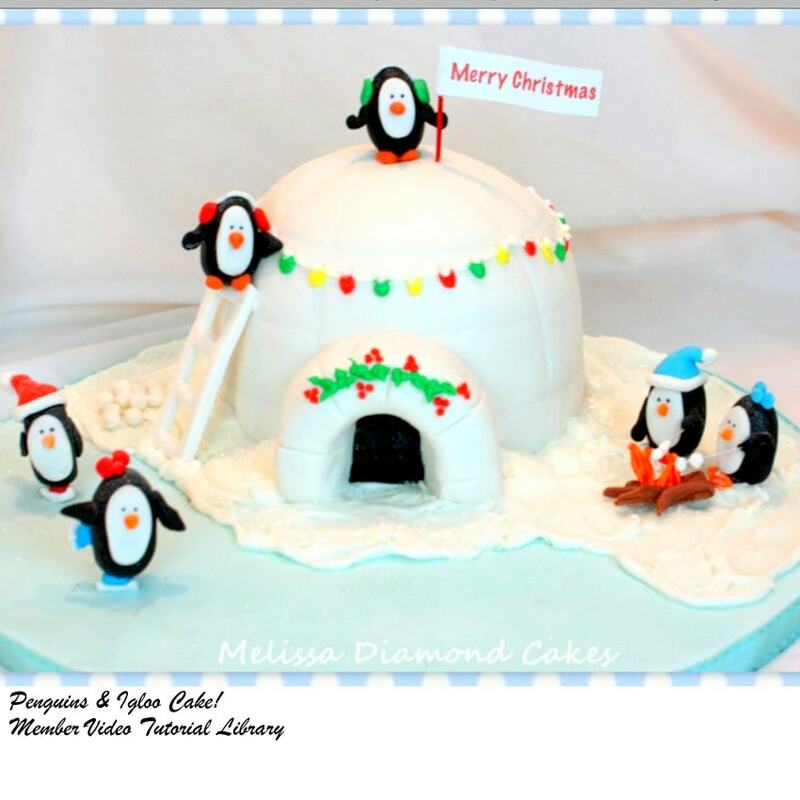 This Snow Globe Cake is a recent favorite new addition to our member cake video section! 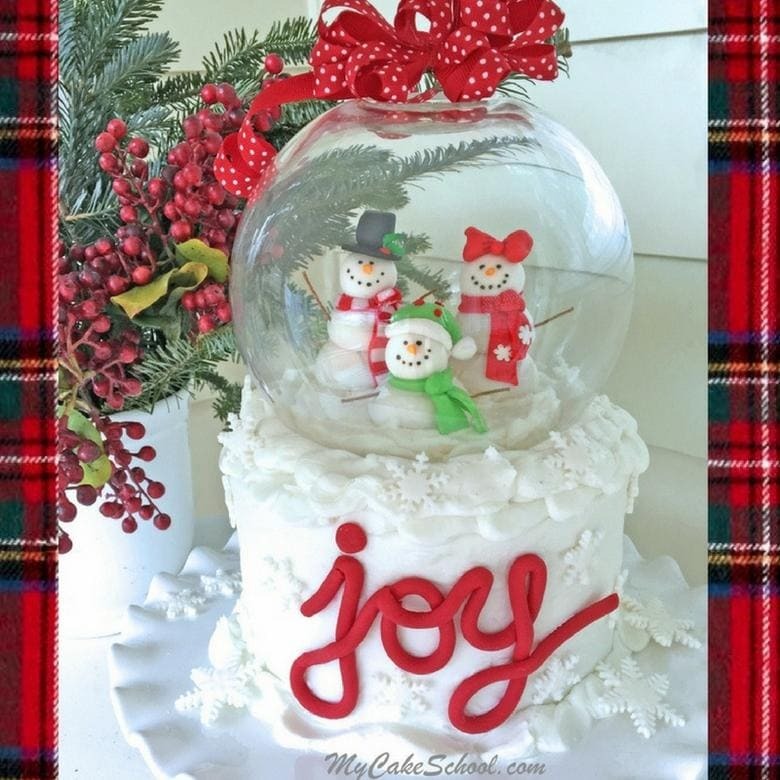 This sweet snow globe cake is one that we’ve wanted to make for a while! We were so happy with it, and it would make the perfect centerpiece for any Christmas or winter gathering! 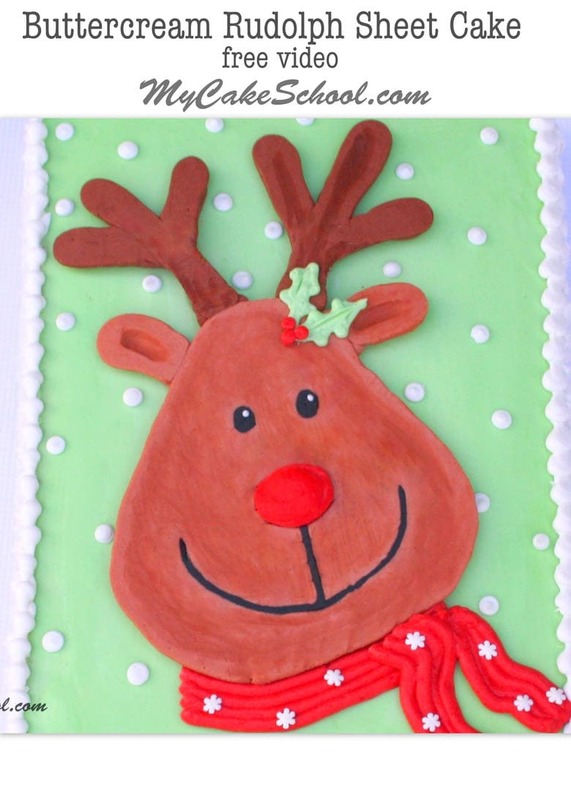 Here is a cute free video tutorial for a sweet Rudolph Sheet Cake! This is a buttercream transfer tutorial with template included. Great for all skill levels of decorating! 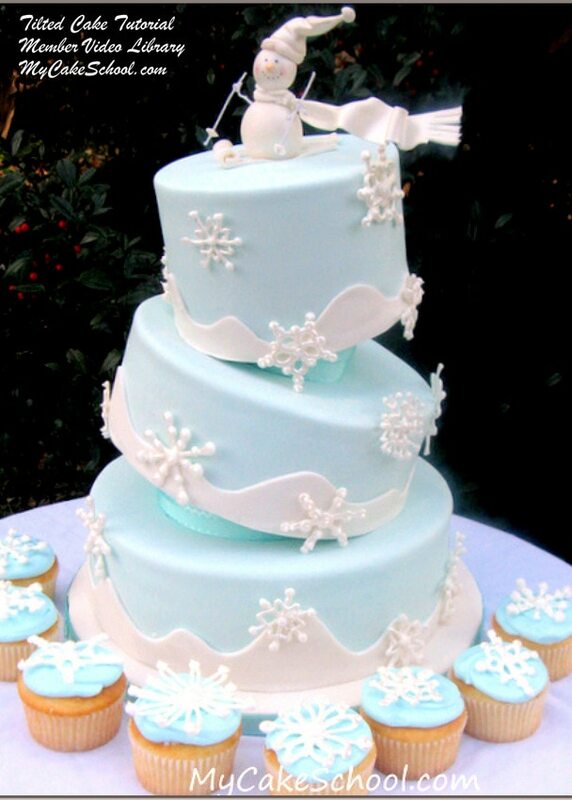 Once you’ve learned how to create a frozen buttercream transfer, you can use the method for any theme! 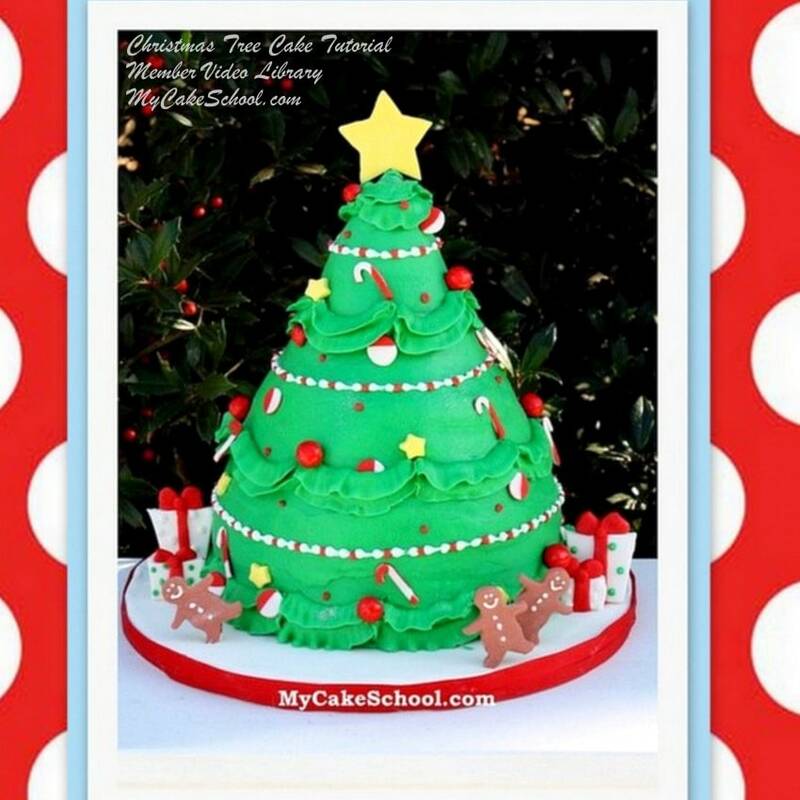 Next we have a quick and easy free video tutorial for a Christmas Tree Cake! 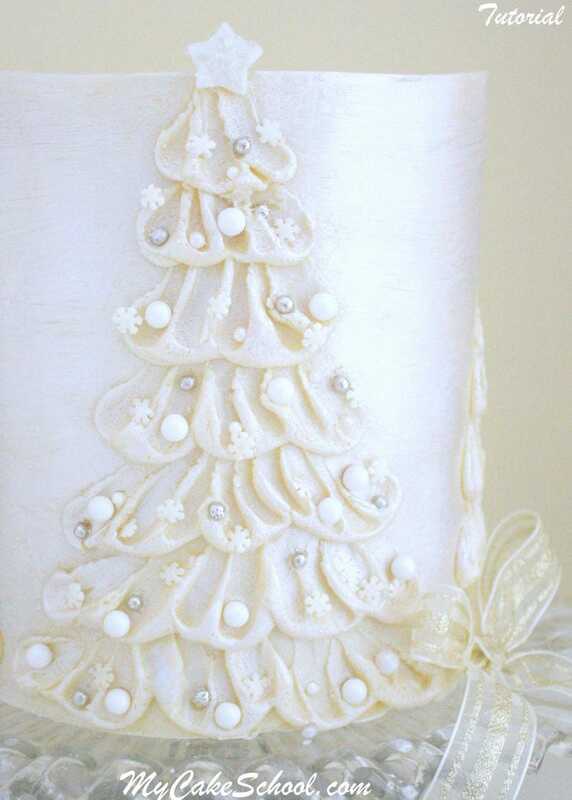 The simple rows of buttercream ruffles bring this Christmas Tree cake together in a flash! 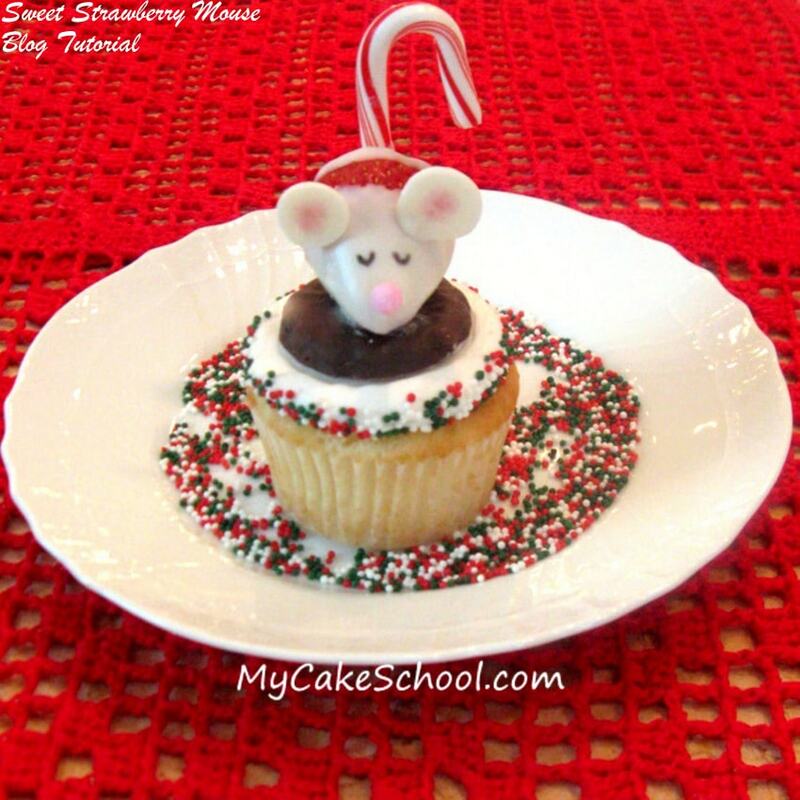 Decorate however you’d like for an adorable, easy dessert! 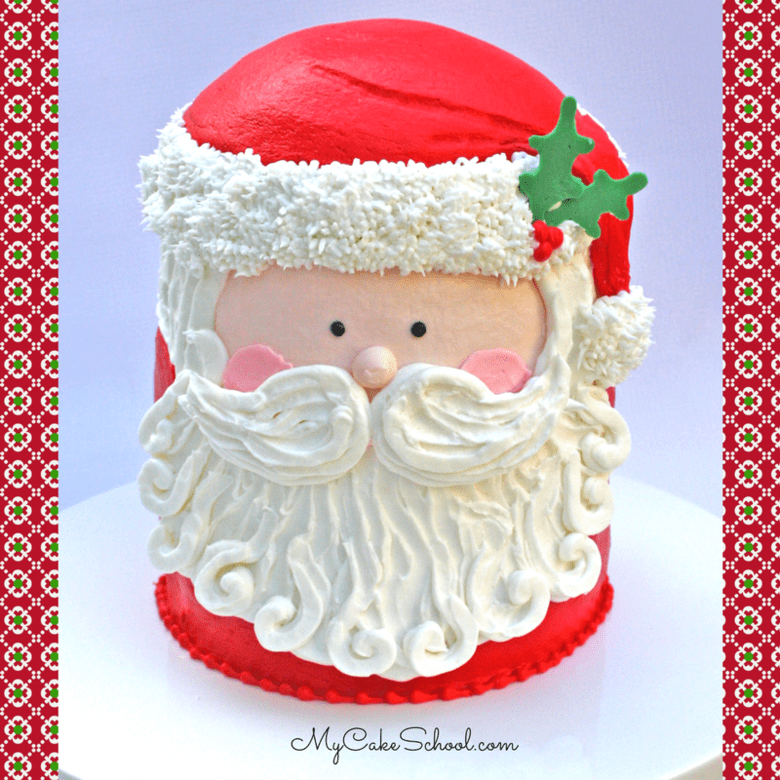 This sweet Buttercream Santa Cake is a favorite from our member cake video section! I love his sweet face! Perfect for Christmas gatherings. I just love his sweet face, and I also love that he is all buttercream! OH So good!! 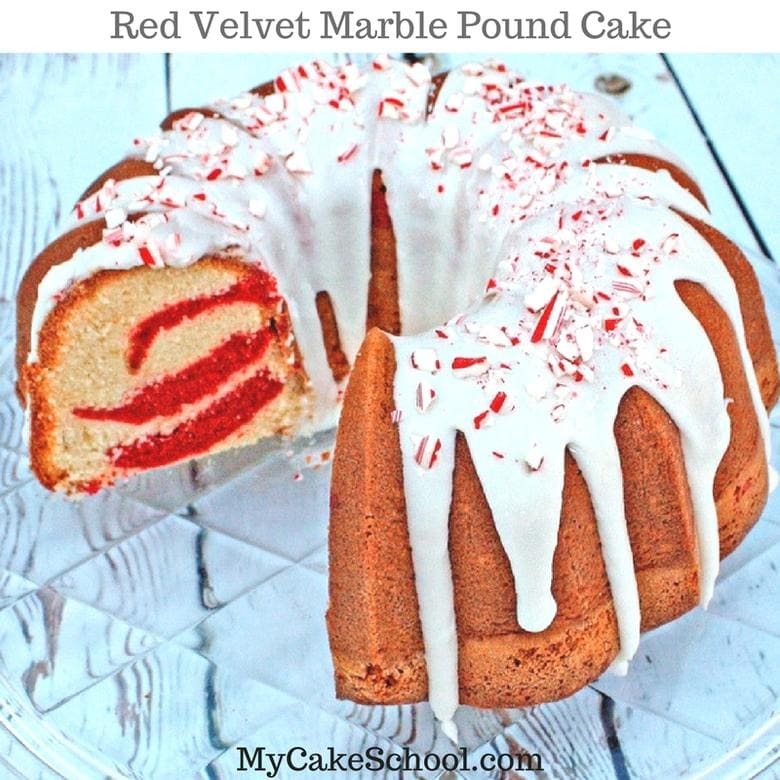 Next up, a heavenly Red Velvet Marble Pound Cake with Peppermint Glaze! The flavor and velvety texture of this pound cake is just magical. You’ll notice a hint of cocoa flavor from the red velvet swirls. This is a new favorite of ours for the holidays (or any time of year! )The peppermint glaze takes it to another level of deliciousess! 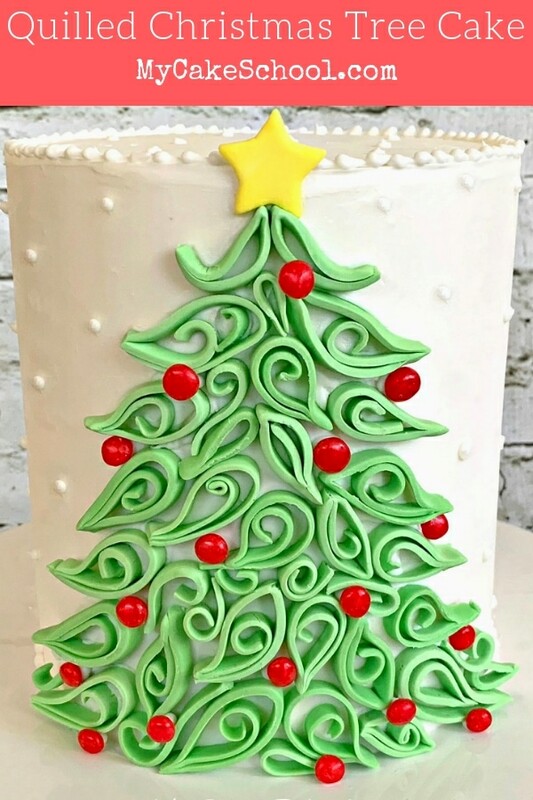 Here we have a festive Christmas tree of buttons~ This tutorial will show you how to easily make embossed fondant buttons for a unique Christmas tree cake! Elegant Chocolate Trees! Chocolate candy/bark coating makes for a quick & easy design. This time of year, when in doubt, I add a chocolate tree or two! This is one of our most popular for the season! We made this little guy (and friends) in our first year of My Cake School! Just a simple little strawberry & chocolate mouse, but isn’t he cute? Santa!! 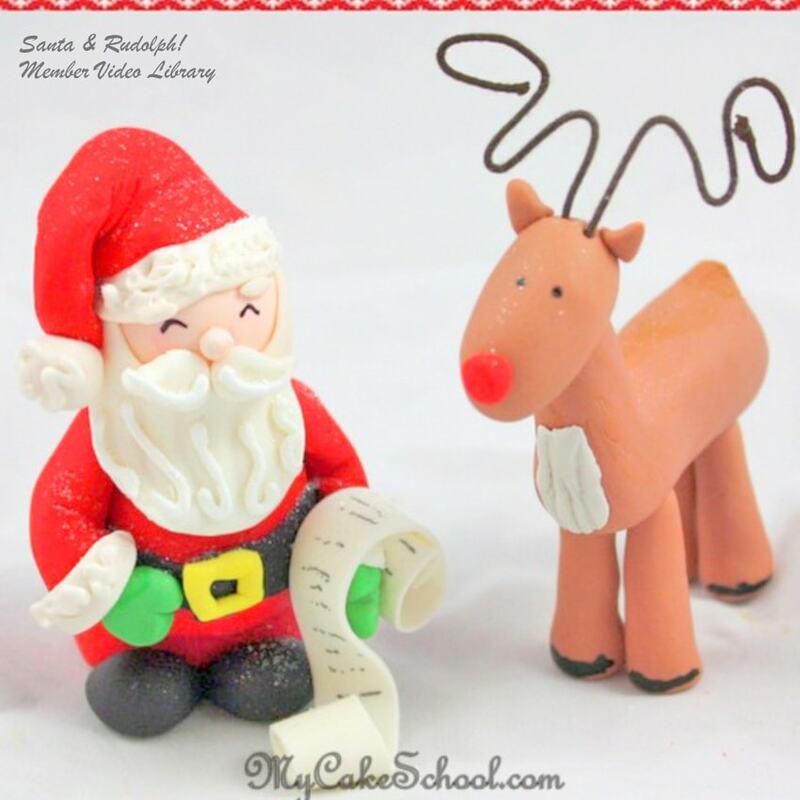 This is one of my favorite tutorials for Christmas. 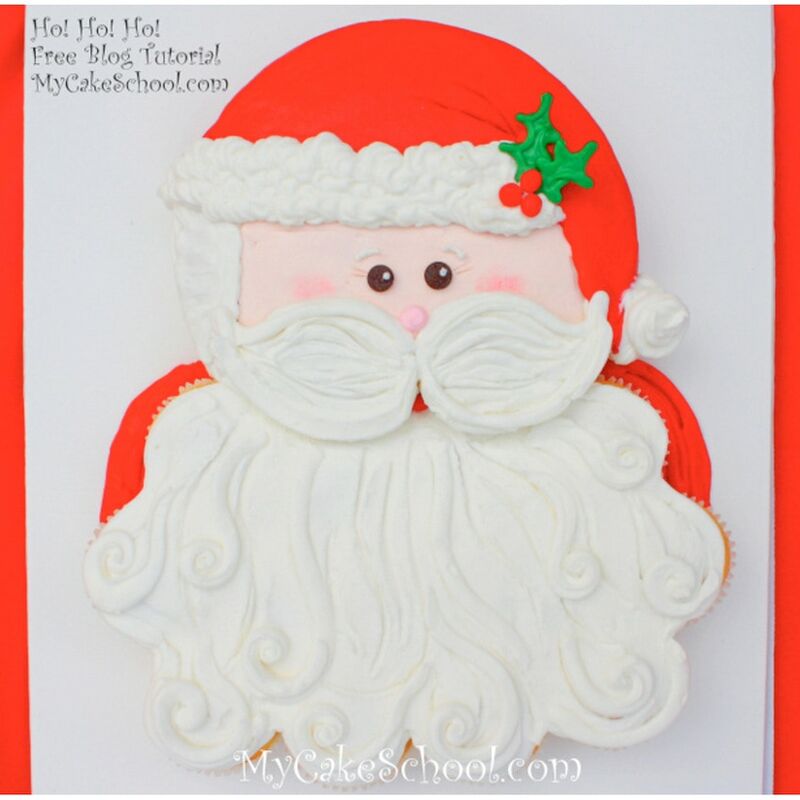 He is a buttercream frosted cake with a cupcake pull-apart beard! Kids love this design! Perfect for Christmas parties! 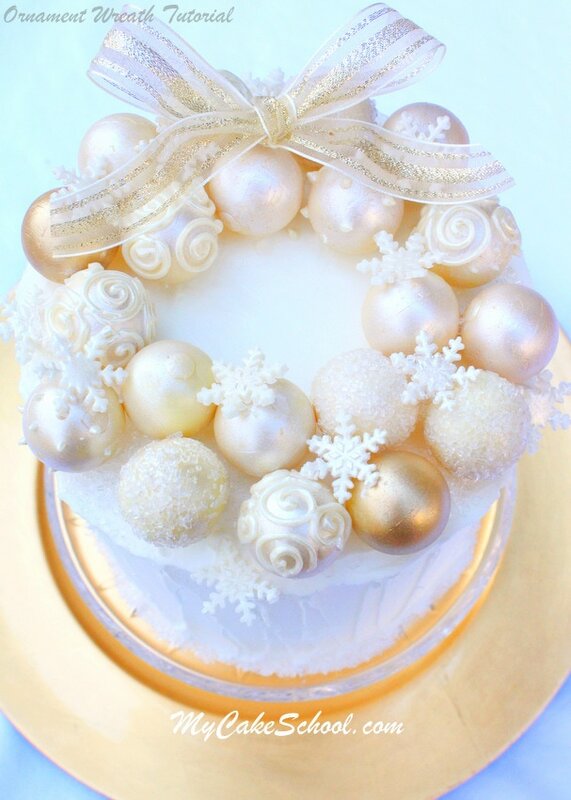 Our ornament (truffle) wreath tutorial is a new favorite of mine! So elegant (and nobody would guess how simple!) I love it when I receive messages with photos attached from all of the people who have followed our tutorial to make wreath cakes of their own. It’s definitely one of our most popular for the holidays, I love uniqueness of this design! I just love buttercream, but if it can be ruffled buttercream , I love it even more! 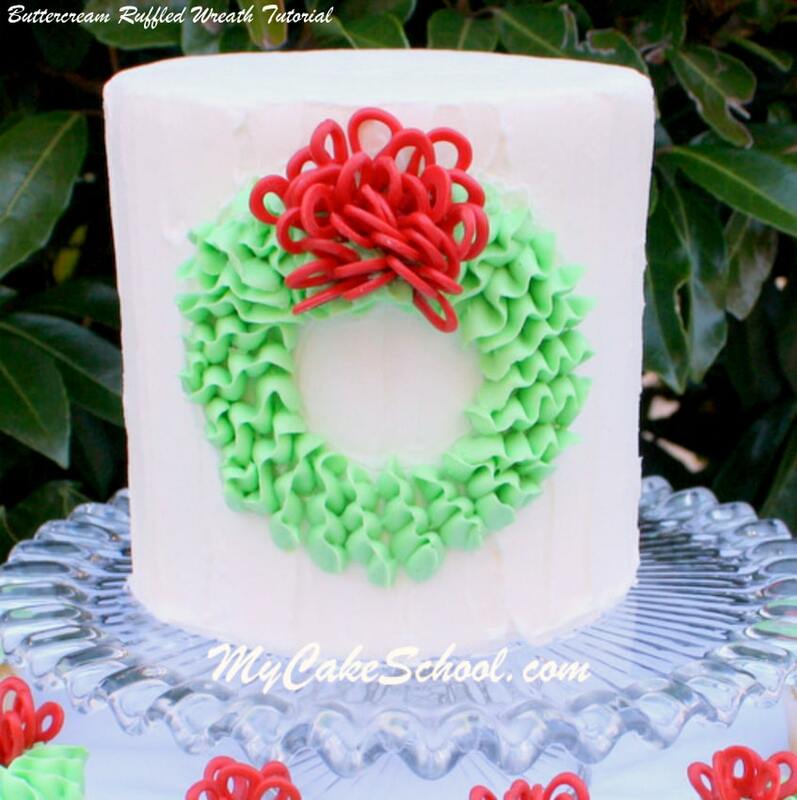 This ruffled buttercream wreath is another simple and unique design. I made matching cupcakes too! Another oldie, The Polar Express! In this blog tutorial, you will learn to make a lovely sleigh bell topper. Next, we have little mini candy bar reindeer!! 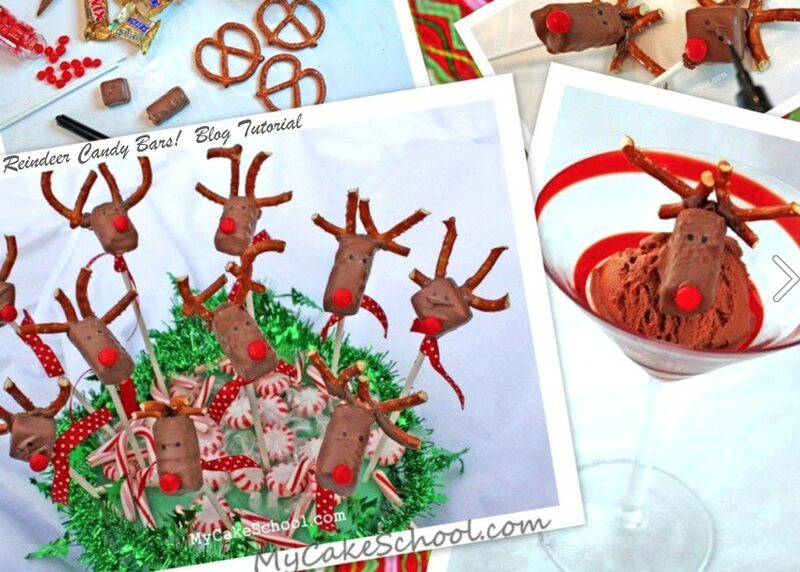 Whether on a stick or on top of chocolate ice cream, these make adorable party treats! 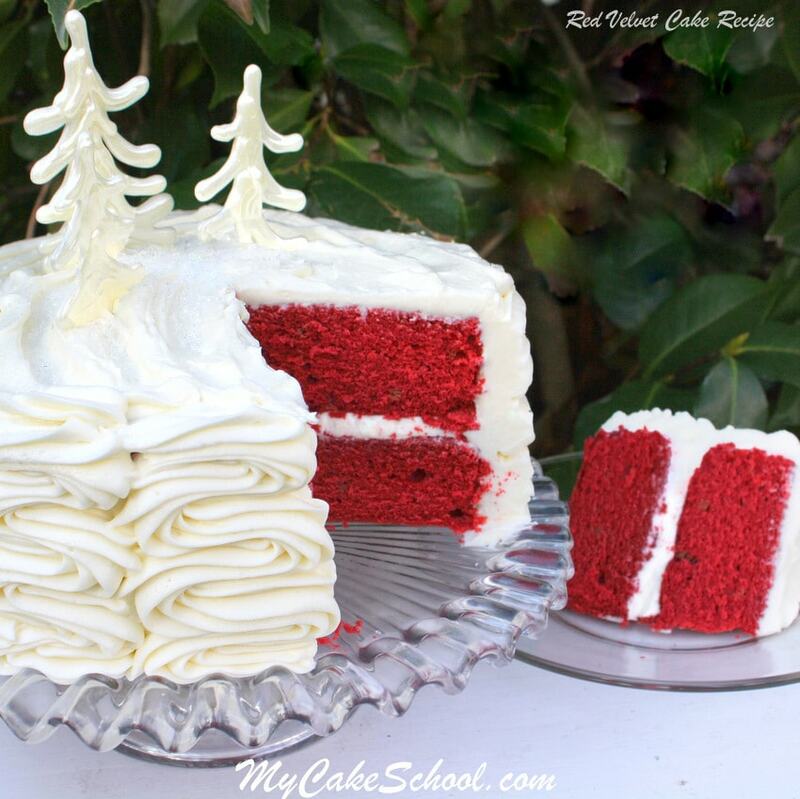 Next on our list of cake recipes is our scratch Red Velvet Cake! This festive holiday cake is so moist and delicious with the perfect amount of chocolate! Our family just loves it! If you prefer a doctored cake mix version of Red Velvet cake, we have a great one in our Recipes section. Enjoy! 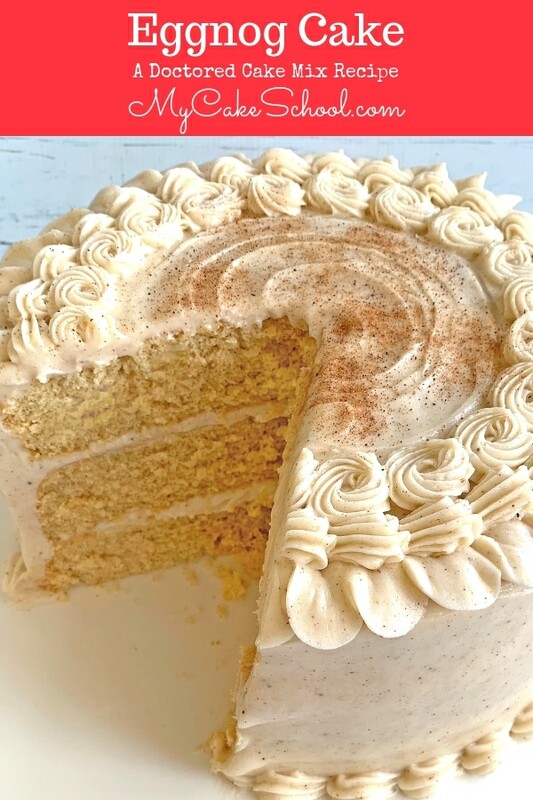 Ooooh Eggnog Cake is another favorite recipe of mine! This scratch cake is so flavorful and moist. A winner for Christmas parties!! 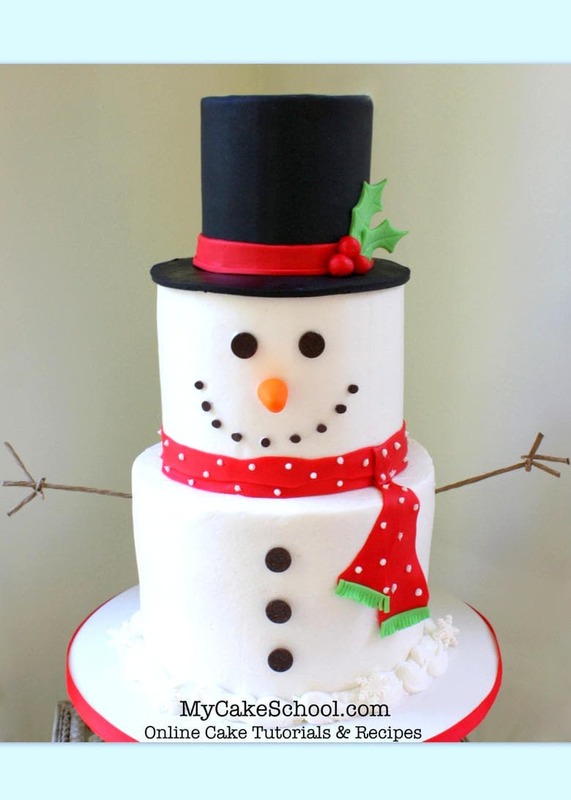 From our Member Cake Video section, here’s a super cute and easy Tiered Snowman Cake! I just love him, and he could not be easier to put together. 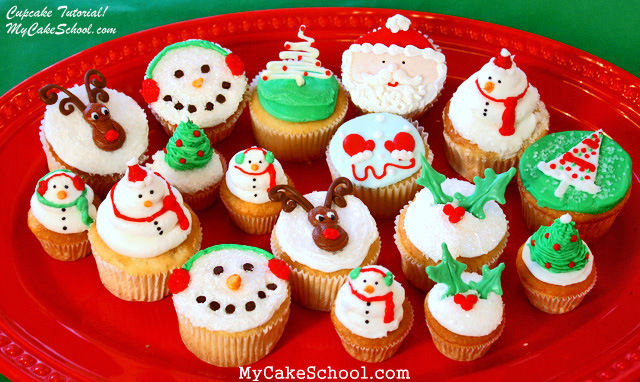 This would be adorable on any Christmas or winter party dessert table! Next up from our Member Section, our sweet Birch Yule Log with Birds! What’s cuter than these sweet birds with their hats and scarves?! This is a fun spin on the traditional yule log cake, and creating the birch bark is a snap. We go through the entire process from start to finish in this video for creating the yule log as well as the birds! 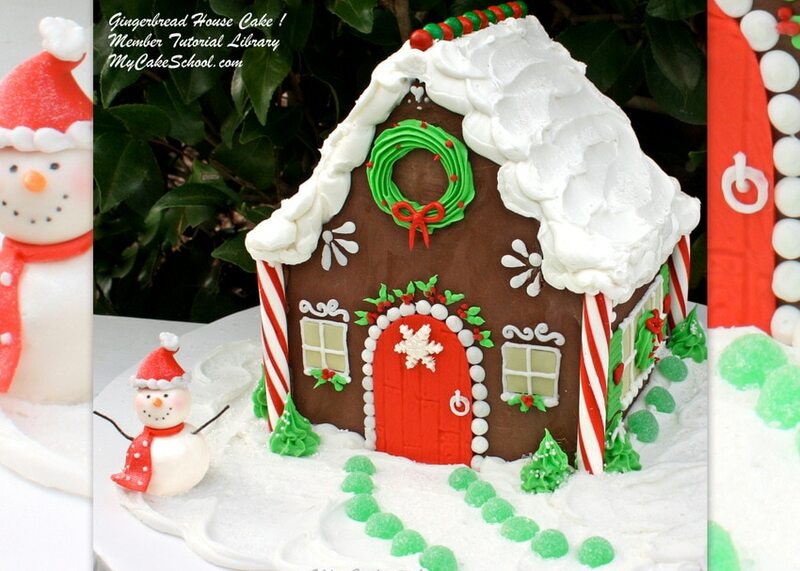 From our Member Cake Video Section: Here’s our recent gingerbread house cake video tutorial! We had the best time decorating this one! This would make the perfect centerpiece, and kids would love to help decorate it! 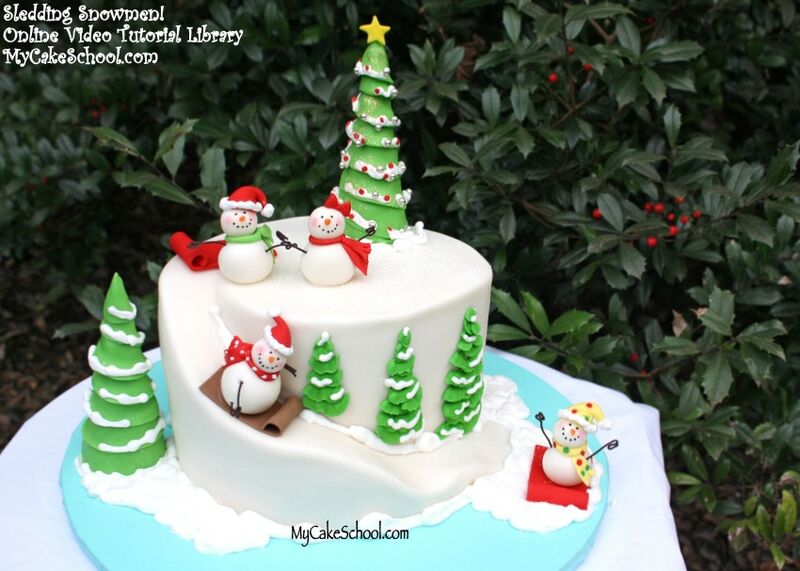 Next up from our Member Cake Video Section, Our sledding snowmen! 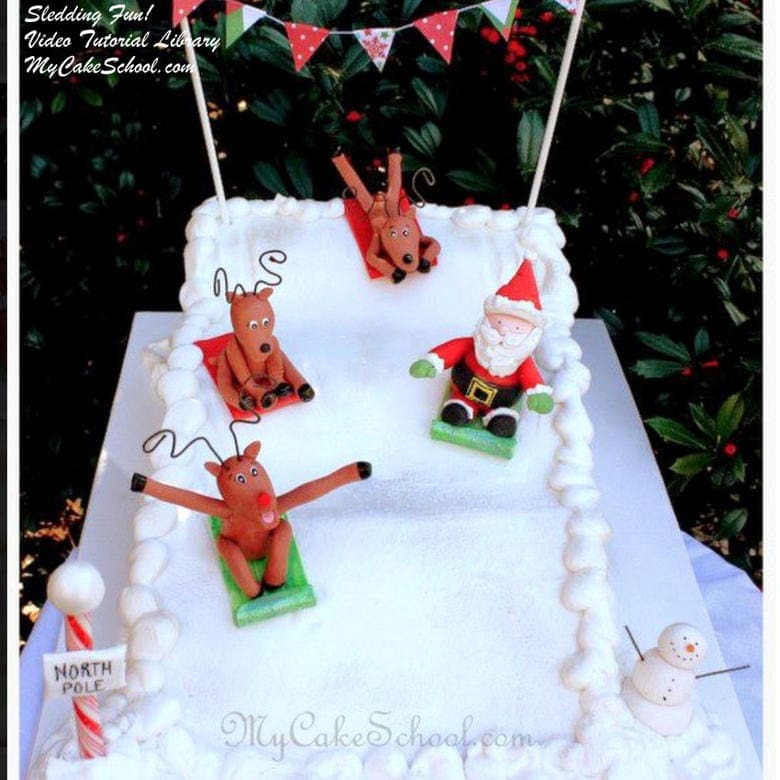 Learn to carve a sledding hill into your cake along with some cheerful snowmen! ;0) One of my favorites! Member Section: Yule Log! 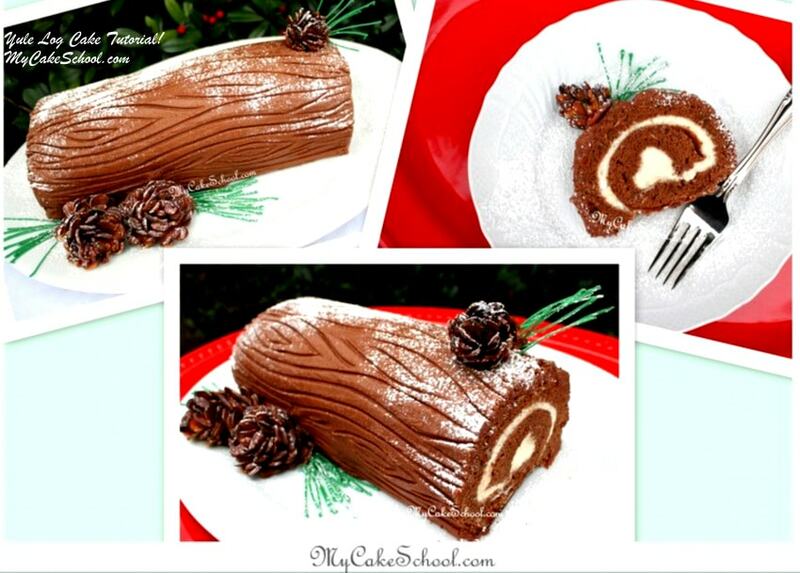 In this video, you’ll learn to make a cake roll & decorate as a yule log! 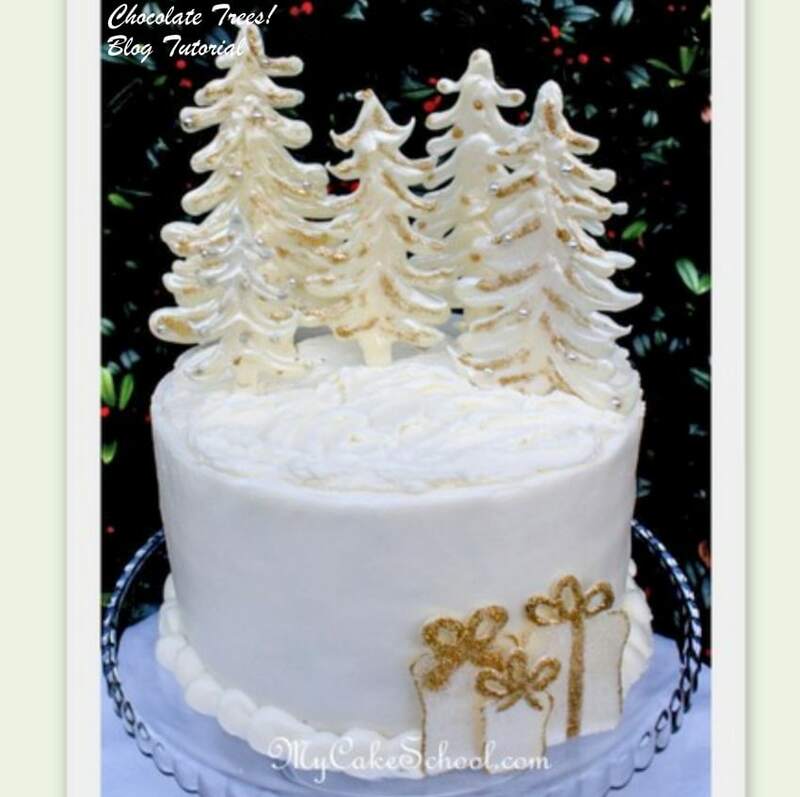 This cake is frosted with chocolate buttercream, even the pinecones & pine needles are edible. 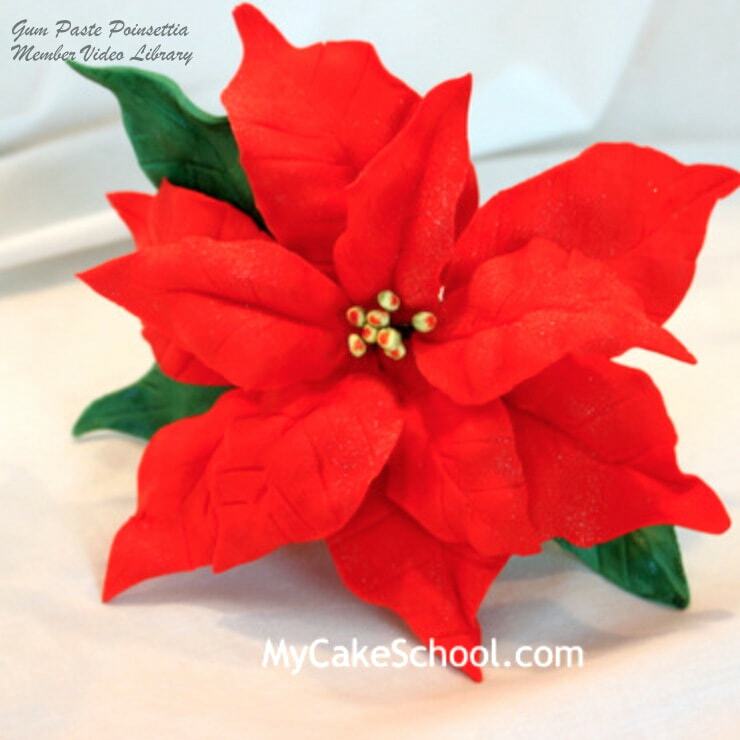 Member Cake Video Section- Crown your cake with a Gum Paste Poinsettia! 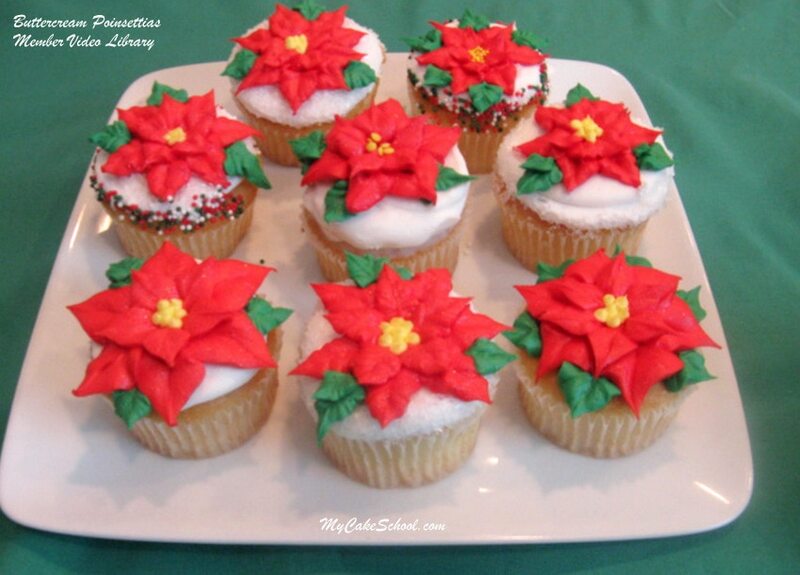 Member Cake Video Section: Buttercream Poinsettias are so quick & easy, but so beautiful on a platter! Learn to make them in this video! 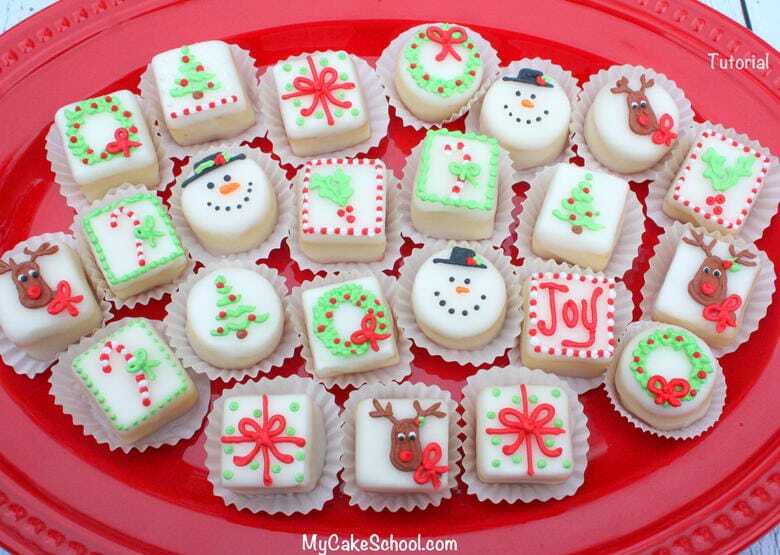 Member Section: These Christmas Petit Fours always make me smile! They are just so cute and the designs are very simple. In this cake video tutorial, we teach you our favorite methods for easy petit fours, as well as how to decorate them! 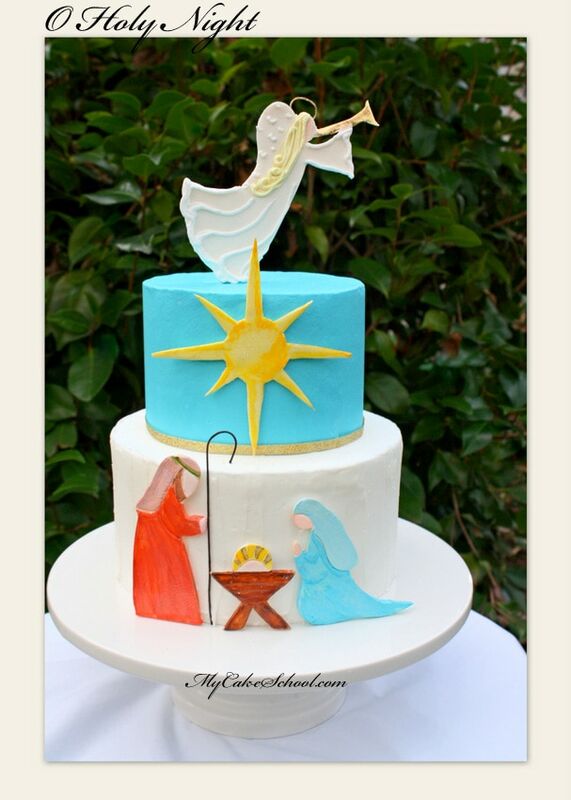 And finally, from our member cake video section, our beautiful Nativity Cake video tutorial. Sometimes the simplest decorations can be the most elegant, and I love the Christmas story that these simple gum-paste cut outs tell. Enjoy the video! 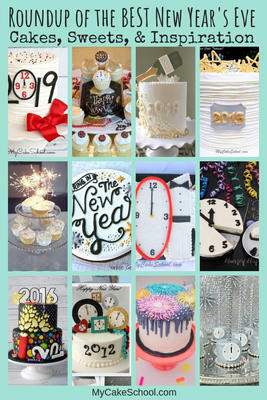 If you’re already looking ahead to New Year’s Eve, don’t miss our Roundup of Favorite New Year’s Eve Cakes, Tutorials, Recipes, and Ideas! All are adorable. Thanks for another great year of cakes. You gals are the best! Thanks for sharing all of your great talents! Have a happy holiday season! Thank you Ann & Nancy! Thanks you so much. I love them all! Awesome! Thanks so much! Merry Christmas and Happy New Year! Thank you for sharing all these lovely tutorials. Wishing you all a Merry Christmas and Happy New Year. 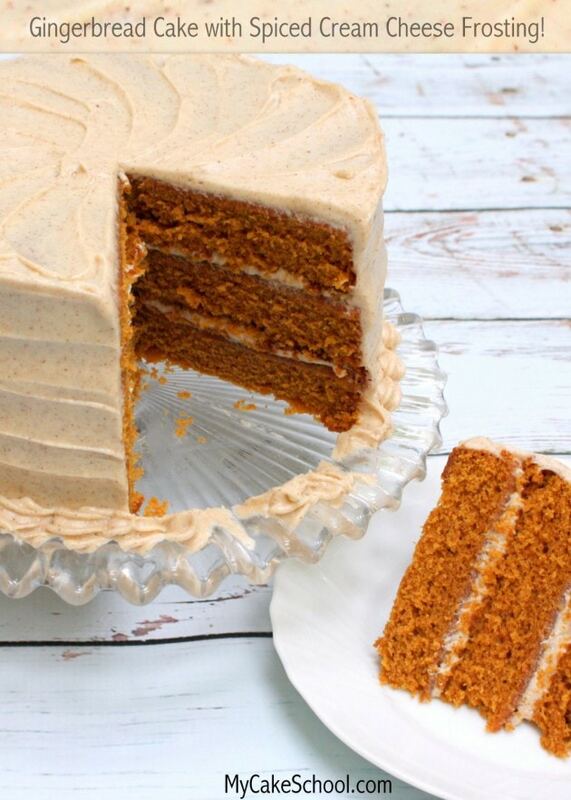 I just came across your website…I was looking for an eggnog cake recipe and yours look amazing! I was given a bottle of eggnog that contains booze in it and I don’t drink it but prefer to bake with it and your recipe looks wonderful…I can hardly wait to try it…I wish I had your website at Christmas….wow! 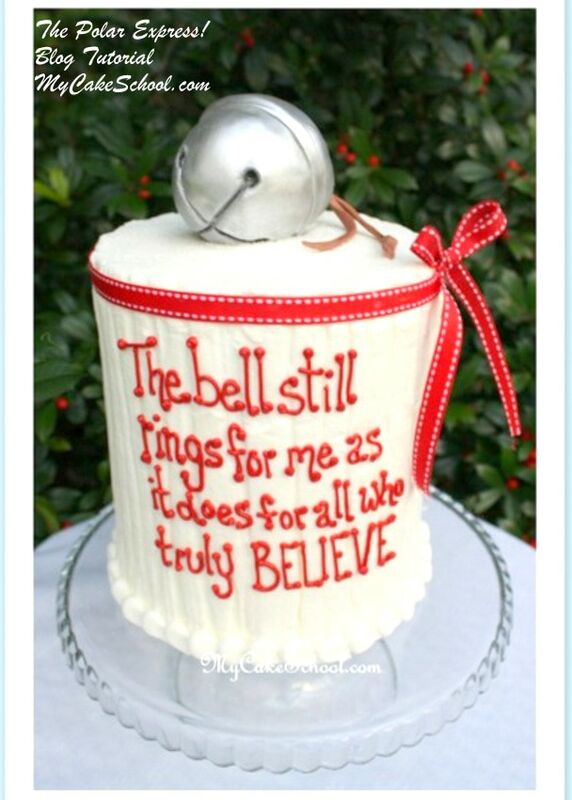 Thank you for posting…I’m not good at cake decorating, maybe I will be daring enough to try to learn.